Quilt To Give Sets Goal to Stitch 300 Quilts! This will be the eighth year that Nancy Zieman’s Quilt to Give quilt pattern will be sewn and quilted during the annual Quilt Expo in Madison, WI, September 6–8. If you aren’t able to be at the event, you, too, can make a twin-sized quilt, then donate it to a local shelter or charity. Nancy made the first Quilt to Give design in 10-days, sewing a little each day. She chronicled the 10-day journey with full instructions on how to make the quilt on the NZP blog. Our hope is that sometime in the near future, you and/or your quilting group will consider making this easy quilt design, made with columns instead of blocks, and then give it away. Hence the name Quilt to Give. The Quilt to Give project will again be the community service project at the annual Quilt Expo, Last year over 28 bed-sized quilts were made and/or donated by participants. Quilts were donated to those affected by the 2017 flooding in Houston, TX, Enchanted Makeovers and Domestic Abuse Intervention Services (DAIS). Read about our 2018 goal, below! Nancy Zieman Productions and Wisconsin Public Television would like to thank the many Quilt Expo Volunteers, Quilt Expo Attendees, the talented team at M&R Sewing and Vacuum, and the team at Baby Lock Sewing Machines for your many years of sponsorship and service of Nancy Zieman’s Quilt To Give. Several kind souls present completely finished quilts at Quilt Expo— New Quilts of all patterns and colors are welcome. Receive a Quilt To Give Volunteer Pin when you stop in and stitch 30 min., donate fabric in bright colors (1/4 yd. or more), and/or donate a finished/new bed quilt! 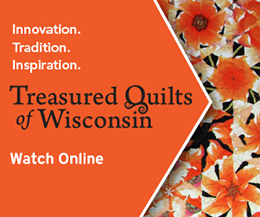 We’re looking forward to seeing some of the NZP blog readers at the Quilt Expo in Madison, WI, September 6–8, 2018. For many of you, the logistics of attending may not be in the cards. Yet, we encourage you to make one of these easy Quilt to Give projects with the intent of giving it away! Bed-size quilts of all sizes are welcome. Twin-sized quilt donations are great, too—twin-size is the size we’ll be sewing during the event, too. Why? Two organizations that will be receiving finished quilts, Enchanted Makeovers and Domestic Abuse Intervention Services (DAIS) have both requested this particular size. Enchanted Makeovers services national women’s shelters and Domestic Abuse Intervention Services (DAIS) is a Madison-area woman’s shelter with twin-sized beds in each room. Here are links to all 10 Quilt to Give Lessons, or visit QuiltToGive.org. 2011: Thirty-five quilts were collected and an additional 10 were completed during the show. Quilts were distributed locally and twenty-five were sent to Joplin, MO. 2012: Twenty-five quilts were collected and 11 were completed during the show, which were distributed to those in need by Baby Lock dealers across the country. 2013: Sixteen quilts were collected and 15 were completed during the show, which were distributed to those in need by Baby Lock dealers across the country. donated to Enchanted Makeovers and Domestic Abuse Intervention Services (DAIS). 2015: Thirty-five quilts were collected and an additional 10 were completed during the show and donated to Enchanted Makeovers and Domestic Abuse Intervention Services (DAIS). 2016: Fifteen quilts were collected and an additional 12 were completed during the show and donated to Enchanted Makeovers and Domestic Abuse Intervention Services (DAIS). 2017: Seventeen quilts were collected and an additional 11 were completed during the show and donated to those affected by the 2017 flooding in Houston, TX, Enchanted Makeovers and Domestic Abuse Intervention Services (DAIS). 2011-2017 Totals: 267 Beautiful Bed Quilts! (164 donated and an additional 79 completed on site at Quilt Expo). 267 Total Beautiful Bed Quilts—to date—Donated to Individuals and Families in Need! 2018: Plans are underway to complete 16 bed quilts onsite with hopes to collect 17 bed quilts at the 2018 Quilt Expo, September 6–8, 2018. (16+17 = 33 Quilts!) This is our largest quilt goal to date! With your help, we will collect and sew 33 quilts, and achieve 300 quilts made with Nancy Zieman’s Quilt to Give community service project. Quilt To Give UPDATE, September 12, 2018: In addition to the many donations of fabric, batting, and time; 14 quilts were collected onsite at the 2018 Quilt Expo and an additional 15 were completed during the show. Plus we’ve received multiple pledges from Quilt Expo attendees and NZP Blog readers that they will be shipping in finished quilts by the end of September! WOW! We’re confident we will reach our 2018 goal to collect and sew 33 quilts! Thanks to the generosity of all, we will meet our goal of 300 Quilts in 8 years of Nancy Zieman’s Quilt To Give Project! For a chance to win two tickets to Quilt Expo, and four fat quarters, please leave a comment below showing your support for Nancy Zieman’s Quilt to Give. Such a versatile quilt pattern. It can be made in so many color ways or even scrappy. It is a great stash buster. I enjoy making quilts to give. Love this .I make baby quilts.I would love to make a quilt to donate. What a great stash buster quilt. Hope to stop and do some sewing at this years show. Can we mail the finished quilt? If so what address? Is there a specific date these need to be done by? Donations may be shipped, anytime of the year, to Nancy Zieman Productions, 211 Corporate Dr., Ste. D, Beaver Dam WI 53916. Thank you! For the 2018 Goal–Quilts must arrive by September 29, 2018. I have watched Sewing with Nancy since it first aired. And have been making charity quilts for many, many years. Always inspired by the segment on her show where she talks with ladies who do that also. Will definitely try this pattern. Great idea! Sounds like a quilt to learn on since I am new to quilting! It’s so heartwarming to see this cause continue and I sincerely hope the goal will be met. So many of us are willing and able to contribute our labors. I was just going through my fabric stash earlier today, feeling quite overwhelmed. What a great way to organize fabric and make a beautiful quilt for someone in need! I am new to quilting but hope to perfect my skills by making a Quilt to Give. Lovely quilt. I will be will you all in spirit. I am making pillow cases for a local women’s shelter. Thanks to all who share. I am a member of 2 quilt guilds in Hot Springs,At and believe this is such a rewarding cause. I am notifying both guilds today to get on board with this great cause and make some quilts!! Thanks so much for being such a fan of Nancy Zieman show for years!! She is dearly missed by all of us, but we will always treasure what we learned from such a great lady quilter!! My Mom sister, niece & I attended one of the expos years ago. It was great. We are all active in Project Linus which provides blankets to children. Thank you for the give away! I would love to attend quilt expo and make a quilt but I live in Sturgeon Missouri I will make one and mail it to you. My quilt guild does lots of charity quilts too! I am all for making quilts for gifting to people and organizations. The bright colors can uplift anyone’s spirit. I love the work you do to help other…your a beautiful person..
this will be my first year attending the quilt Expo. I can hardly wait to see all the beautiful quilts and the effort put into them! I have enjoyed Quilt Expo for five years now and think this project deserves our support. It is a tribute to Nancy that this work continues. LOve this idea and the beautiful quilts that you make. I love the caring and sharing you all do. Thank you for the ideas and pattern. I have a Friend who needs a gift of love, This will be perfect. I will share this ideas with my Quilt Guild also. Thanks for all you do. I thinks I have gone every year of the Expo and enjoyed every one. Our guild donates to the local Hospice (don’t forget the guys) and to Lakeland Sharing. Would you except a twin top if it wasn’t quilted? Thank you for all you do. It is encouraging to see the lovely quilts made for donation. I have been disheartened by so many that are thrown together without thought of the person who will eventually receive them. If you are destitute and are given an ugly quilt, while it is still useful and appreciated, I don’t think it fills the soul. These lovely quilts will. I’ve never had a chance to go to your Expo, but one of these years……maybe I will!! Our church ladies have been quilting to donate to a local charity but have done mostly crib sized quilts. This is an inspiring pattern to us for making bed sized quilts. Love the idea of using Jelly Rolls this way on a quilt, rows of solids and print stripes vertically. Someone would really love a quilt made this way. This is the first time I have heard of this project, being a newbie quilter. I certainly hope I can finish a quilt in time to donate. I would like to donate to Harmony House, here in Huntington, WV. I really enjoyed the time I spent at Quilt Expo working on Quilts to Give. Nice people to work with because all volunteers. For those who can not attend and wish to donate a quilt, where would we send it to? Thank you for your support! Quilt to Give donations may be sent to Nancy Zieman Productions, 211 Corporate Dr., Ste. D, Beaver Dam WI 53916. I’ve been trying to find a way to use up my fabrics that I bought escpeially for giving. This is a quick and beautiful way to do so. Thank you AGAIN for another reason to help out! Bright colors makes a beautiful quilt. I have volunteered to help this great cause for several years at Expo and cherish the memory of working alongside Nancy. Please stop by and give at least a half hour of your time, you’ll be glad you did!